Any visit to the island of Maui feels like a luxurious celebration. 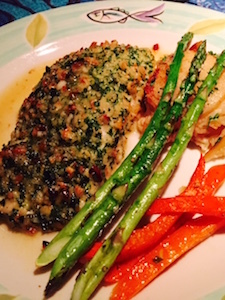 A meal at Mama’s Fish House raises that feeling to a higher level. Listed as one of the Top 100 Restaurants in the U.S. by Open Table, Zagat, and Trip Advisor, Mama’s Fish House on the north shore of Maui, Hawaii, combines ocean views, romantic atmosphere, and the freshest fish with attentive service, gourmet preparation, and delectable taste. “Mama” is Doris Christenson, and her Executive Chef is Perry Bateman. The menu showcases Polynesian foods using the best organic produce from Waipoli Farm and fish caught the same day they are served. In fact, the menu even names the fishermen who caught the fish and the place where they were caught. A recent version lists ahi caught by Alan Cadiz in the Alenuihaha Channel, ono caught by Joe Hobson off the north shore, and monchong caught by Carl Bertelmann off the coast of Hana, among others. Free valet parking is provided. Come early to enjoy the coconut grove and the beach before you go inside. Make a reservation, and a table will be waiting when you arrive. Richly-colored table linens and fine china and crystal set the tone for your meal. Prime beef is available to order, but seafood is the star of the show. For an appetizer, you might try crispy mahimahi rolls with Hamakua mushroom sauce and poha berry jam. In the mood for octopus? Perhaps a diver has brought one in that morning after an offshore dive in Kanaha. Or maybe you’d like to start your meal with wasabi-crusted calamari or Kauai shrimp won ton. These and other exotic starters will be offered to discriminating diners. What about raw fish? Try Papa’s three-fish sashimi (ono, ahi, and anaga) or Hawaiian ceviche. The daily soups might range from lobster luau soup with a sweet potato crisp to spicy mahimahi soup with Kauai clams and watercress noodles. One entree choice: ono sauteed with Haakua Ali’I mushrooms in garlic butter, white wine, and capers. Another entree choice: monchong pan seared with Maui onions, Kula watercress, and avocado. But there will be at least 10 other mouth-watering options to choose from. On a recent menu, “Tristan Island Lobster Tails from the most remote inhabited island in the world” was the most expensive entree listed. 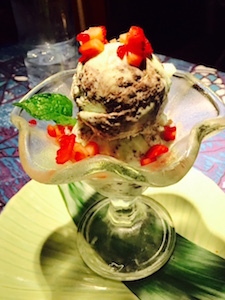 If you let the staff know you are celebrating a birthday or an anniversary when you make your reservation, you are likely to be served a complimentary treat, such as homemade mint chocolate chip ice cream with fresh strawberries, and a personalized card will be waiting at your table. Another luscious dessert possibility is a banana nut crisp with vanilla bean ice cream. You can’t go wrong. Everything on the menu is distinctive and delicious. And the restaurant’s vibe meshes seamlessly with its breathtaking location. 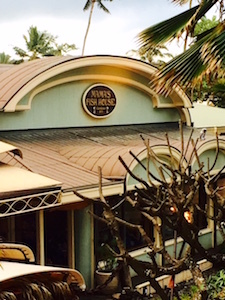 Mama’s Fish House is open daily from 11 a.m. to 9 p.m. You’ll find it one and a half miles past Paia on the famous Road to Hana. Look for the fishing boat marking the entrance to the parking lot.